The U.S Powerball record jackpot stands at an awesome $1.586 billion, and was won in January of 2016. The current Powerball jackpot is now at £115 million* and looks set to keep on rising. We take a closer look at record Powerball jackpot winners and let you know how you can place a bet on this lottery giant from the UK. Powerball is one of the largest lotteries in the United States and also one of the most famous lotteries in the world. The reason for its success is simple: 7 of the 10 biggest jackpots ever have been paid out by Powerball, including the staggering $1.586 BILLION record jackpot which was won in January 2016. We have more details on some of those fortunate Powerball winners below. A 2016 study found that only 0.01% of families in the US in 2012 had a level of wealth of more than $100 million. Powerball jackpot winners have the chance to join that exclusive club as there have been around 100 Powerball top prizes to date which have exceeded that figure. The world record Powerball jackpot stands at an awesome $1.586 Billion and was shared by three ticket-holders in January 2016. Because the total jackpot was divided three ways it means there have been larger single-ticket winners of this American giant and the three winning couples have to settle for 'only' fifth place on our list. Mavis Wanczyk from Massachusetts held the record for the largest individual win when she claimed the $758.7 million jackpot in August 2017. The 53-year-old had hardly let the news of her win settle in before she had phoned her employers to hand in her notice after 32 years. However, that record was broken in March 2019 when a lone ticket-holder won a Powerball jackpot worth $768.4 million before taxes. Gloria MacKenzie from Florida was 84 when she landed the third-largest Powerball jackpot in 2013. Gloria decided to take the cash lump sum of $370.9 million rather than an annuity, and took home around $270 million after taxes were deducted. She spent some of her winnings upgrading from a small apartment to a beach-side apartment and made a $2 million donation to the local high school, but since then has remained out of the limelight. We don't know a whole lot about the winner of the fourth-biggest Powerball jackpot other than the fact that she is female and from New Hampshire. The winner went to court to have her anonymity protected and so is the only one on the list whose name we do not know. To place a bet on US PowerBall lottery you must choose 5 numbers out of the 69 available and an extra number, called the PowerBall, between 01 and 26. To win the Powerball jackpot you must get all 5 numbers and that extra PowerBall correct. To make the game even more exciting, there is the option to activate PowerPlay, which is a multiplier that can be added to your bet and which doubles the first prize if you win it, and multiplies by up to 10 times the prizes of categories 2 to 9. In addition to the first prize there are another 8 categories of prizes, making the chances of your winning some prize, even if it is only a return on your investment, quite reasonable. How Much Does it Cost to Bet on Powerball in the UK? Due to the enormous size that Powerball jackpots can reach, the cost of a line bet is not fixed as with the majority of other lotteries at Lottoland. Even giant European lotteries have fixed bet costs since they are capped at a certain level, but there is no limit as to how big the Powerball record jackpot could get. For that reason, the cost of a line bet can potentially increase from £3 to £6 in cases where the jackpot is higher than $500 million USD, at Lottoland's discretion. 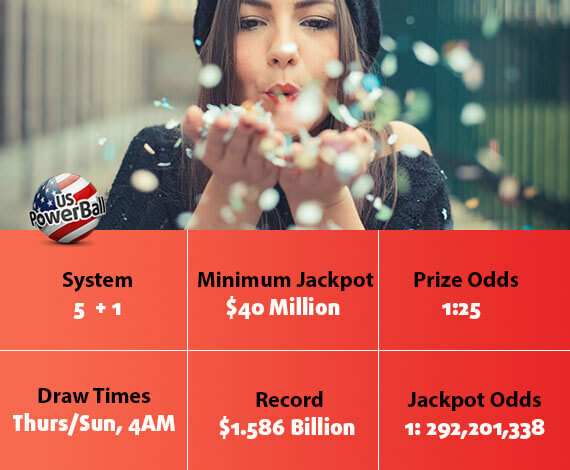 Although the chances of winning the first prize of PowerBall are pretty steep - 1 in 292,201,338 - the chances of winning one of the 9 categories of prizes are quite good, with much more manageable odds of 1 in 25! For example, by hitting only the extra ball, PowerBall, you win a Category 9 prize, which is worth about $4 (approximately £2.60). What Happens if I Win Powerball? If you are fortunate enough to win a prize by betting on Powerball with Lottoland, winnings will automatically be credited to your account. Once the money is in your Lottoland account you can simply withdraw your winnings by one of the available withdrawal methods. We will contact you by telephone if you manage to bag one of the highest tier prizes. Lottoland replicate the pay-out structure of the Official Lottery Draws in America and for this reason the total prize is reduced by 38% to make allowances for the tax Official winners in Tiers 1 to 3 would have to pay. Lottoland may pay out the Winnings in Prize Category 1 over 30 years (the “Annuity Option”). The lump sum method will be paid out at 60% of the total value of the annuity amount. Thanks to its unique insurance model, Lottoland guarantees to pay out even the largest of Powerball jackpots. 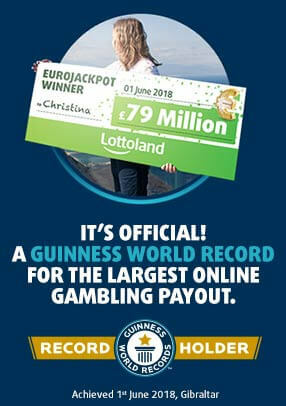 Go here to try your luck and place a bet on the record-breaking Powerball lottery with Lottoland from the UK! 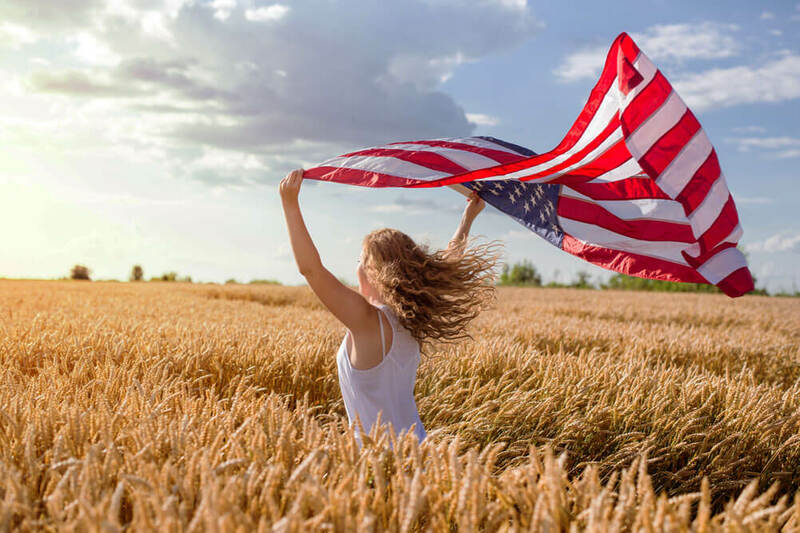 *Tier 1 winning bets on the US Powerball are paid out as 30 year annuity or discounted lump sum at Lottoland’s election, and Tiers 1 – 3 are also subject to 38% reduction as per T&C's.